Foreign firms are beginning an exodus from China as U.S. tariffs threaten to cut into their profits. The departures aggravate an overall trend of foreign businesses leaving China that actually predates the U.S.–China trade war. As operating costs in China have risen, due to increasing worker wages and land prices, many multinationals that once turned to China for cheap manufacturing are now looking elsewhere. The exiting companies range from startups to major manufacturers. Nathan Resnick, CEO of Sourcify, a startup that helps companies manufacture products abroad, told Forbes magazine that the U.S. tariffs have made production in China less attractive. “With all these tariffs coming, why not run some of your production runs elsewhere? Companies are saying that the scare of these tariffs has decreased the incentives to manufacture in China,” Resnick said. He added that many companies have been leaving China anyway, as labor costs for lower-skill labor are currently cheaper in places like India, Bangladesh, Vietnam, Philippines, and Mexico. In early July, Mitsubishi Electric CEO and President Takeshi Sugiyama told Japan’s Kyodo News Agency that the company will cancel buying auto parts from China and instead import from Thailand and elsewhere. And in May, South Korean tech conglomerate Samsung closed a factory in the manufacturing hub of Shenzhen City, in southern China, that produced liquid crystal display (LCD) television screens for export—on concern about the prospect of falling profits when the United States first announced plans to impose a 25 percent tariff on imported Chinese tech goods. Meanwhile, companies are beginning to turn to Southeast Asia for their manufacturing needs. For example, Kerry Logistics Network, a firm specializing in supply-chain solutions, says that its clients have begun shifting production lines to Malaysia and other Southeast Asian countries where they already have manufacturing plants, according to July 30 report by South China Morning Post. The manufacturers took action as early as March, in order to avoid U.S. tariffs—the latest round of which will hit $200 billion worth of Chinese goods, ranging from food products to beauty products to furniture. Part of the exodus is because Beijing is encouraging the upgrading of its manufacturing sector toward high-tech products, so as to move up the value chain and compete globally. But as China has yet to make key breakthroughs in technologies such as semiconductor chip-making, the exit of foreign manufacturers could spell trouble. Some foreign high-tech manufacturers are already leaving. 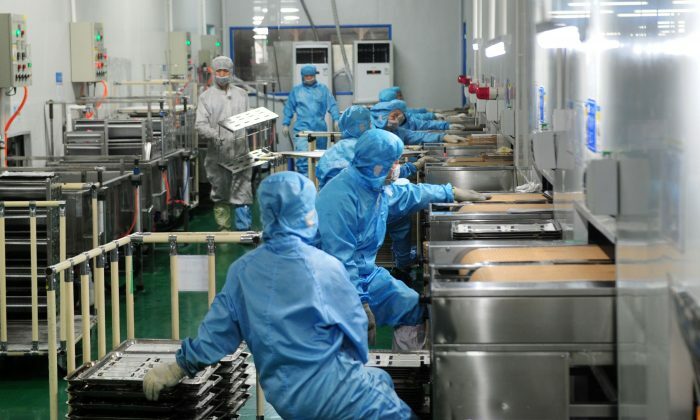 Omron Corporation, a Japan-based electronics firm specializing in factory automation systems and electronic components, announced on July 16 that its Suzhou City factory will close. In June, AU Optronics, a Taiwan-based electronics manufacturer that is among the world’s largest manufacturers of TV panels, announced it would close its Shanghai factory. Japanese electronics manufacturer Nitto Denko in January cited rising labor costs when it announced plans to leave the Chinese market and shut its Suzhou factory, which manufactures polarizers used in television screens.